Sterling Publishing (NY), 9781402786990, 192pp. No other job so deftly merges the transcendent with the tedious as motherhood. And mothers would be the first to admit they could always use a little support and guidance. 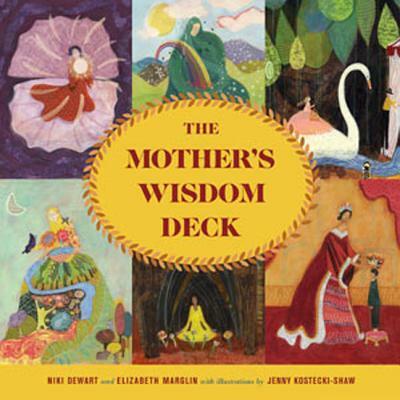 So, in honor of all the moms in the world, here's the "Mother's Wisdom Deck." This beautiful kit features a full-color book plus a deck of 52 cards whimsically illustrated with universal symbols of empowered motherhood. Arranged into four suits--Natural Mother, Animal Mother, Ancestral Mother, and Divine Mother--these cards can either reveal a message (like Tarot) or simply provide moms with inspiration and wisdom for their lifelong journey. NIKI DEWART, M.A., is an independent curator and writer specializing in ritual arts and wisdom traditions. Niki also has led youth rites of passage for the Ojai Foundation, and guided experiential pilgrimages focused on ritual arts, healing traditions, and indigenous wisdom. ELIZABETH MARGLIN, M.A., studied Asian religion with Robert Thurman at Columbia College and received her MA in journalism from CU Boulder. She freelanced as a health, fitness, art, and travel writer; ghostwrote Deepak Chopra's newsletters, and is an editor at "Natural Solutions" magazine.